It’s tempting to think you can design a house which will serve its purpose for many decades to come but the reality is that houses are constantly being changed, added to, and adapted. It makes sense to build in a degree of flexibility from the beginning. This is very much a green issue because the energy and materials consumed in these apparently small improvements is enormous. You only have to look at the DIY market and at how many of the transactions at a builder’s merchant are very small scale. The Lifetime Homes Foundation gives a good overview of the design principles involved, using their 16 Design Criteria. 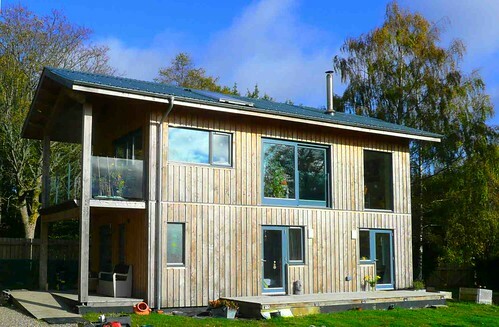 The Code for Sustainable HomesCode for Sustainable Homes. A delightful tool for assessing how green a home is. Unfortunately now withdrawn (2015) by this short sighted government., level 6, also recognises this aspect of design. Very seldom are houses deliberately designed to take later additions or extensions, either horizontally or vertically and often things like roof construction make it expensive to add extra space. The one exception to this is the increasing number of houses which deliberately allow for extension into the roof space at a later date. Very often the design of a house precludes any easy modification and complicated modification usually involves a considerable addition of embodied energythe total amount of energy it takes to make a material (or a building). See more on embodied energy, usually fossil fuel based. It is also usually rather expensive and does not provide optimum results in design terms. Putting aside, for the moment, issues about planning permissionthe legal basis for being allowed to do some form of development such as building a house. (not to be confused with Building RegulationsThese are the mass of regulations that cover safety, health, welfare, convenience, energy efficiency etc. in the way buildings are constructed. Not to be confused with Planning consent (which is more to do with whether you can put up the building in the first place). See more on the regulations which are all about whether the building is properly constructed). see more on Planning the legal basis for being allowed to do some form of development such as building a house. (not to be confused with Building Regulations which is all about whether the building is properly constructed). see more on Planning, what is it that affects whether we can put houses to other uses? Entrances can be located more centrally to create the possibility of dividing a house into two. Alternately, having a second entrance can be used to provide a separate flat. If the hatched area becomes a separate flat for renting out to someone other than the family (i.e. a tenant rather than a lodger) then the red dividing wall would have to be a fire separating wall[for the purposes of part E (sound) of the Approved Documents] - Wall that separates adjoining dwelling-houses, flats or rooms for residential purposes. and the area of the flat shown hatched would have to be fire and sound resisting vertically as well. Either one or both the entrances could be used. If the fire and sound resistance were built in to begin with then very little work would be needed for the conversion. Similar arrangements would be possible for converting to a consultation room, office, small shop etc. (Note that there can be insurance ramifications if you partly split a house. For instance if you incorporate an area which members of the general public might visit, such as an office or consultation room then this might affect the insurance of the property if visitors are able to enter other parts of the house). Flexibility can be introduced into living areas. 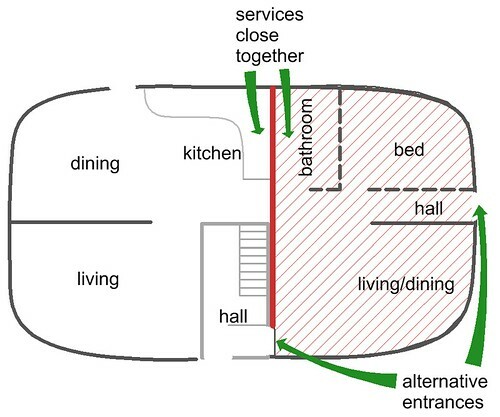 For instance if the wall between the living room and dining area on the left hand side of the plan could be folded back then a very large area would be available for meetings, home cinema, parties etc. The Building regulations have something to say about the heating and insulation of what they call live/work units.